1. Chop or slice all of the vegetables into bite size pieces. 2. Lightly oil a wok or skillet; heat over low until very hot. 3. Add the garlic; saute to a golden brown. 4. Add all the vegetables. Sprinkle with salt and black pepper to taste. 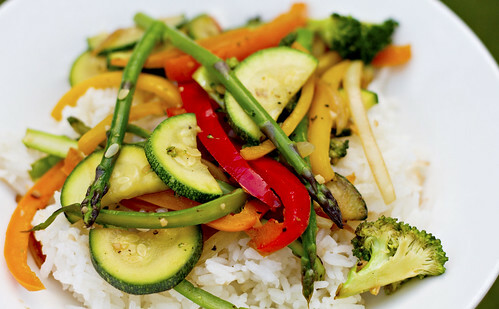 Increase the heat to medium and stir-fry for 3 minutes or until the veggies are crisp-tender. 5. Add the soy sauce and stir well to blend. 6. Transfer to a large bowl, adjust season and serve with rice (I used jasmine rice).